This page is a work in progress. Keep checking back for updates. I omitted this area when I wrote the Climbing Guide because of the private property and access issues, and because I knew little about this terrain. However, over the years I have come to appreciate the environmental quality of this little-known expanse of Idaho. Updated May 2018. 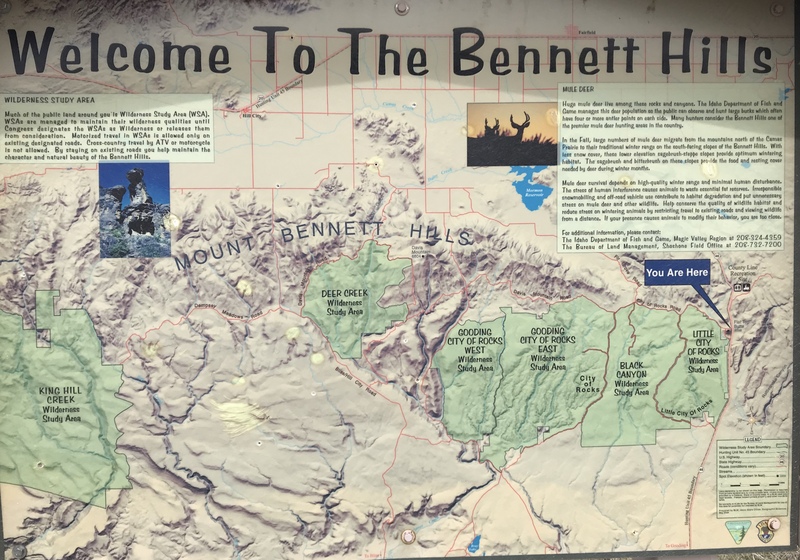 The Bennett Mountain Hills (also known as the Mount Bennett Hills) run west to east from Teapot Dome northeast of Mountain Home, Idaho, east to ID-75, a distance of more than 60 miles. In spite of being called “Hills” by the mapmakers, this geological uplift surrounded by plains is a legitimate mountain range. The Bennett Mountain Hill’s high point is Bennett Mountain on the range’s west end. The range encompasses rugged, remote, and wild country. For practical purposes, the range can be divided into three sections. The western section runs from Teapot Dome to the Mount Bennett Road, which runs from ID-20 south to King Hill, Idaho. The central section is located between the Mount Bennett Road and ID-46. The eastern section is located between ID-46 and ID-75. 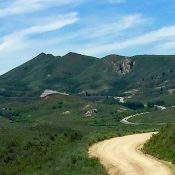 The Bureau of Land Management (BLM) has identified five wilderness study areas (WSA) in the Bennett Mountain Hills. The western section has one WSA and the central section has four WSAs. These untrammeled areas exist today as a direct result of the unforgiving nature of the terrain, which has limited both road construction and vehicle access. Even the areas of the range penetrated by roads are rugged and difficult to travel. More information about these WSAs is provided in the range section discussions below. The BLM, the State of Idaho, and private landowners manage the range. Most of the private land is closed to the public. There is an extensive road system, of varying quality, which provides access to many of the peaks. There are no maintained trails but 4WD roads stemming off of the main roads make good trails. Bennett Mountain, the highest point of this range at 7,438 feet, is an attractive peak. Bennett Mountain rises steeply on its southern, western, and northern sides. 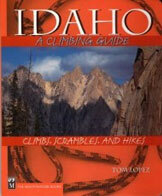 Its attributes closely resemble the nearby Boise Mountains with thick forests and alpine type ridges. The “hills” portion of the Bennett Mountain Hills trails off to the east side of Bennett Mountain gradually losing elevation along the way. Unfortunately, the western end of the hills has more private land than public land, and the State of Idaho manages much of this public land. The State often leases the land they manage to private entities, often under terms that exclude public access. The Boise National Forest map shows the forest boundary encompassing 30 sections of the hills just west of Mount Bennett. Interestingly, only a tiny fraction of these 30 sections is Forest Service-managed public land, and only two of these sections are managed by the State of Idaho. The rest of the land, including most of Bennett Mountain, is private land festooned by “No Trespassing” signs. The BLM does manage most of the public land west and southwest of Bennett Mountain. The King Hill Creek WSA is located in the range’s western section. This WSA contains 29,309 acres of BLM lands. Inholdings include two state sections totaling 1,280 acres and one 40-acre parcel. The WSA contains scenic, highly convoluted topography with a maze of drainages, ridges, hills, and peaks. The lower elevations of the southern edge of the area are dominated by Wyoming big sagebrush, Sandberg bluegrass, and cheatgrass sites. The ridges are covered by sagebrush and grasses with a few junipers. The peaks in the northern part of the WSA are covered with sagebrush, grasses, and small clumps of Douglas-fir and aspen. Riparian areas contain poison ivy, rushes, sedges, grasses, and willows. Teapot Dome from Peak 5268. This section of the range exhibits the most abrupt uplifting of the entire range. Its northern escarpment rises quickly from the nearly flat Camas Prairie to a string of high peaks. The Monument Gulch/Bliss Road demarcates the divide between the western end of the range and the central portion. The central portion runs east to ID-46. Davis Mountain is the highest point in the central portion of the range, south of Fairfield. The range gradually rises out of the Snake River Plain to the range’s crest and then drops abruptly to the Camas Prairie. The central section of the Mount Bennett Hills contains a mix of private, State, and BLM-managed public land. The BLM land is found primarily on the southern side of the crest. 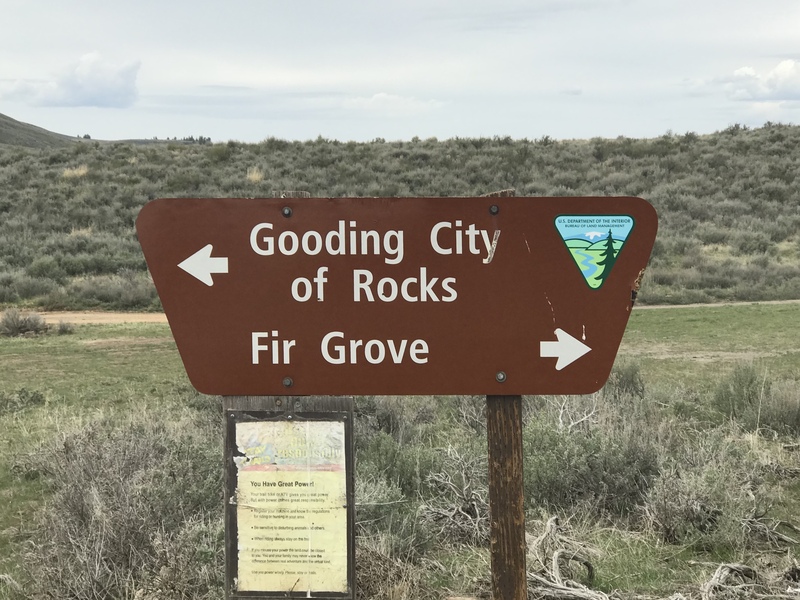 The Gooding City of Rocks West WSA is located in Gooding County, Idaho, and includes 6,287 acres of BLM-administered public lands. The WSA boundary is formed on the west and south by BLM Road 2410, the Clover Creek Road on the north, and on the east by unofficial jeep trails. Portions of the western boundary follow the East Fork of Clover Creek while much of the eastern and southern boundary is formed by State and private land. This WSA is gently sloping prairie on the south face of the Bennett Hills cut by the East Fork of Clover Creek Catchall Creek and other unnamed drainages. These canyon drainages contain rhyolite columns that rise more than 100 feet. Basalt bluffs, arches, pillars, and hoodoos dominate this area. These formations are a continuation of the area known locally as the Gooding City of Rocks. Elevations range from 4,080 to 5,616 feet. Sagebrush and grasses cover the open slopes while shaded canyons that support pockets of willows, aspen, and cottonwood are found in the deeper canyons. Link to map of the two Gooding City of Rocks WSAs. Gooding City of Rocks East WSA is located in Gooding County, 14 miles northwest of Gooding, Idaho. This WSA has 14,743 acres of BLM-administered public lands. The WSA’s boundary is formed on the west by private land and an unnamed non-BLM jeep trail; on the north by private land and County Road 2402, and the Davis Mountain Road; in the east and south by BLM-managed public land and County Road 2401, and the Crist Cabin Road. 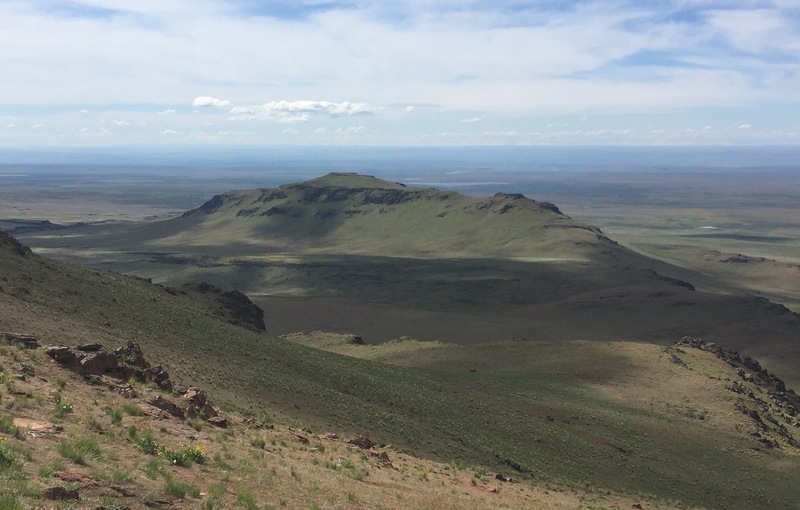 The Mount Bennett Hills in this WSA are a rolling, sagebrush and grass-covered belt of foothills. The southeastern portion of the WSA is composed of a series of deep canyons carved into rhyolite. There are rhyolite columns in the canyons that rise more than 100 feet giving the area its name as the City of Rocks. The BLM notes that “Streams dissecting alternating bands of hard and soft tuff and the weathering processes of freezing and thawing helped create unusual rock formations that resemble stacks of coins mushroom caps arches fins and pillars called hoodoos.” Dry Creek Canyon, located on the western side of the City of Rocks, holds a perennial stream with large sections of pristine riparian vegetation. The fourth BLM WSA in the Mount Bennett Hills is the Black Canyon WSA located in Gooding County, just east of the Gooding City of Rocks East WSA. Black Canyon WSA includes 10,371 acres of BLM-administered public lands of which 640 acres are State-managed lands. The WSA’s boundaries are formed by unnamed dirt roads and a fire break on the west; on the north by BLM and County Road 2401, and the Crist Cabin Road; on the east by BLM Road 2412, and the Burnt Willow Road; while the southern boundary follows section lines. This WSA is flat prairie in the south and gently rises toward the north where rolling hills, broken by canyons, are found while the western edge contains unusual rock formations of weathered rhyolite. Elevations range from 4,360 to 5,484 feet. This area is primarily sagebrush and grass-covered terrain with pockets of willow and shrubs found in intermittent drainages. Link to Black Canyon and Little City of Rocks WSAs map. The fifth and easternmost WSA is the Little City of Rocks WSA, which sits just east of the Black Canyon WSA in Gooding County and encompasses 5,875 acres of BLM-administered lands with a 640-acre inholding of state land. The WSA’s boundaries are formed in the west and south by BLM Road 2412 and the Burnt Willow Road, in the north by County Road 2401 and the Crist Cabin Road, in the east by three material sites and a power line right-of-way parallel to State Highway 46, and in the south by private property. The WSA is primarily a gently sloping plain with several rhyolite bluffs. Its south-central portion is an aggregation of wind and water eroded rhyolite columns collectively known as the Little City of Rocks. Unlike the other four WSAs, the BLM has not recommended any of this WSA for wilderness designation. This link provides access information and additional information on this area. Davis Mountain from East Twin Peak. The eastern section of the Bennett Mountain Hills is located between ID-46 and ID-75. 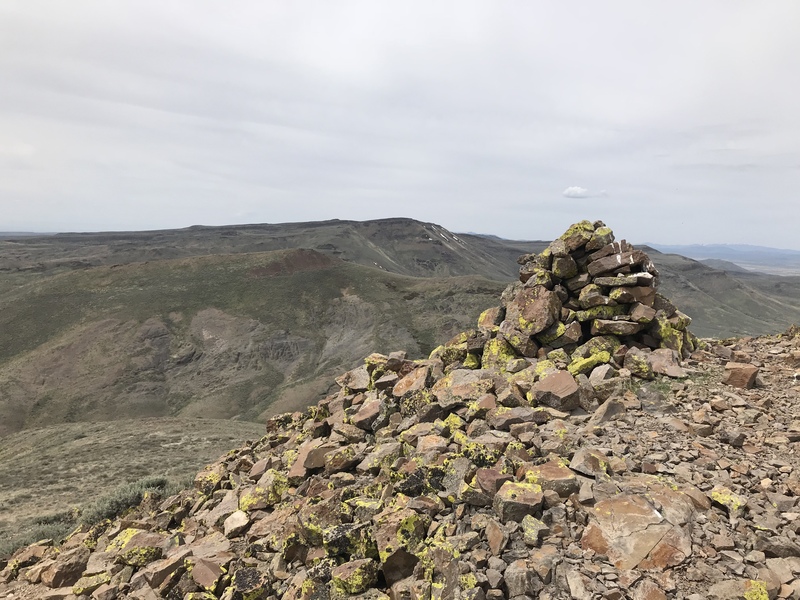 This section is an area of sagebrush-encrusted rolling terrain marked by occasional cliffs and sharp ridges reminiscent of a stormy see frozen in time. Peak 5950 is the highest point in the area where there are few pronounced summits with significant prominence. There are a number of interesting peaks on this area’s far eastern edge including Dinosaur Ridge. In large part, BLM manages the public land in the eastern section. There is also some State land and private inholdings. Access discussions for peaks found on this website are discussed on each peak’s page. A general discussion of access to the range is provided below. The main access roads traverse the range from north to south. Sometimes maintained roads run between these roads. In my experience, the quality of these roads varies greatly from year to year and season to season. Bennett Mountain Road/Glens Ferry Road. This improved dirt road traverses the range between US-20 and Glenns Ferry. It receives a fair amount of use. There is a subdivision you will pass along the way. 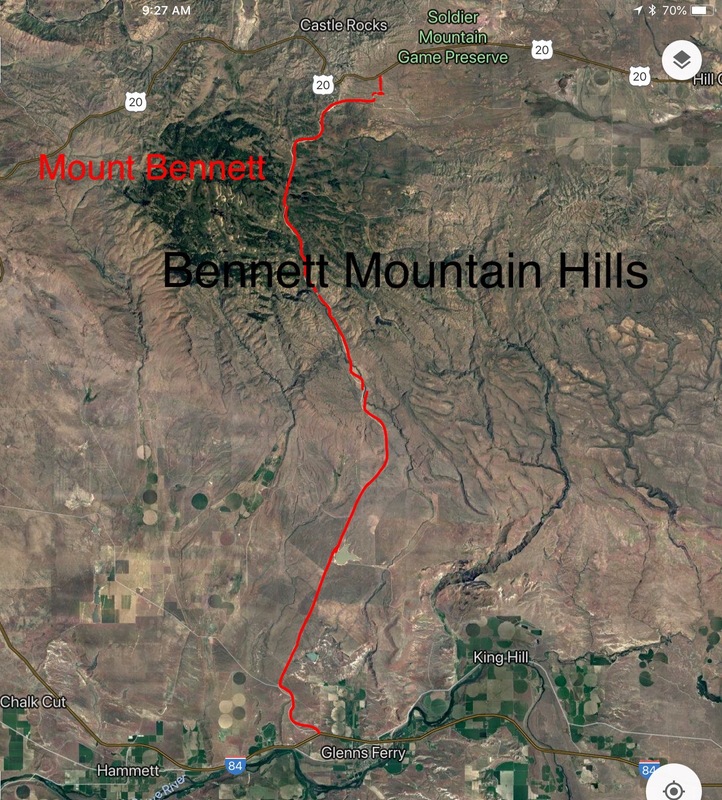 The route of the Bennett Mountain Road. Courtesy of Google Maps. Monument Gulch/Bliss Road. This road is accessed from ID-20 at Hill City. In 2018, the road was recently graded and in good shape. However, like all roads in the Mount Bennett Hills, this road may be rough or muddy at times. In downtown Hill City, turn south at the intersection signed for Camas Prairie Centennial Marsh. Follow this road south until it reaches a three-way intersection. Turn left and follow this road east for 0.5 miles to another junction. The Monument Gulch Road starts at this point. Turn left/south and follow the road into the mountains. After crossing a pass and traveling a total of 9 miles from Hill City, the road reaches a junction with the Dempsey Meadows Road. A sign at this junction states that it is another 22 miles to Bliss. A right turn at this junction onto the Dempsey Meadows Road gives you access to Windy Benchmark. The Monument Gulch/Bliss Road continues south and eventually exits the mountains on its way to Bliss. Continuing toward Bliss for 0.9 miles the Monument Gulch/Bliss Road reaches a junction with the west end of the Davis Mountain Road (see below). Fir Grove Road. The north end of this road can be accessed from US-20 or ID-46. However, from either approach, there is no direct line to the road. Instead, you must follow a number of county roads and make many 90-degree turns to reach the start of Fir Grove Road. But…the good news…Google Maps you will give you great directions to the road’s start. 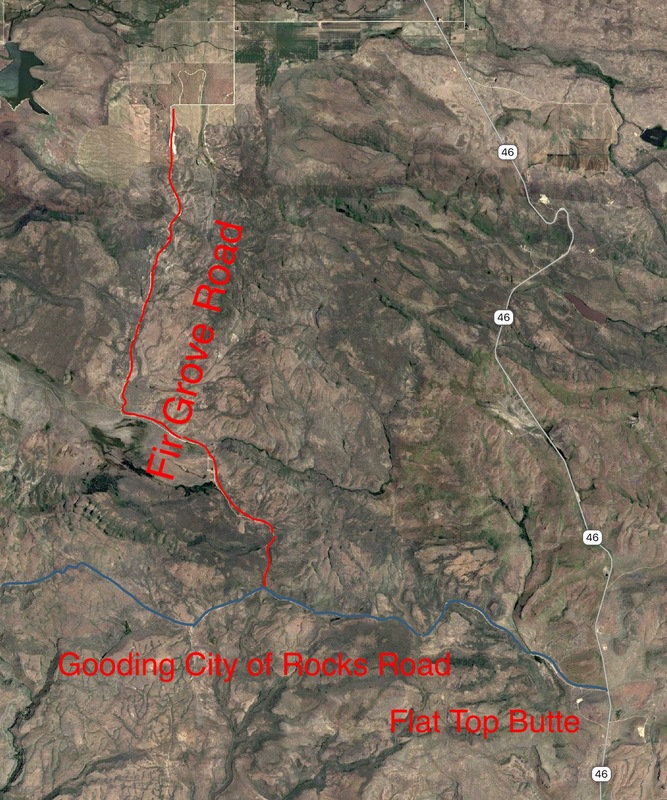 Fir Grove Road passes by the enticing Fir Grove Ranch and then climbs up the escarpment east of Fir Grove Mountain to a junction with the Gooding City of Rocks Road (see below) at a signed junction southwest of Peak 5875. The southern end of the Fir Grove Road starts at this intersection. This State highway begins in Gooding County at I-84, at Exit 157, and runs north to traverse the Mount Bennett Hills, passing west of McHan Reservoir. ID-46 crosses the Mount Bennett Hills at the summit of Johnson Hill, which is 5,635 feet. After descending over 500 feet, ID-46 reaches its northern terminus at US-20 approximately 4 miles east of Fairfield. ID-46 is paved and provides access to the main roads that traverse the eastern and central sections of the range. Gooding City of Rocks Road. To reach this road from the south, take ID-46 north from the US-26/ID-46 junction in Gooding for 18 miles. If you are coming from the north, drive south on ID-46 from the US-20/ID-46 junction for 13.75 miles. Then, turn west at the BLM sign for the City of Rocks. Follow the signs and the road for 7.5 miles. This road is occasionally maintained but is still a rough dirt road with occasional mud holes. While it is advertised as passable for passenger cars when dry, unless it has been recently graded I am skeptical of that claim. Davis Mountain Road. 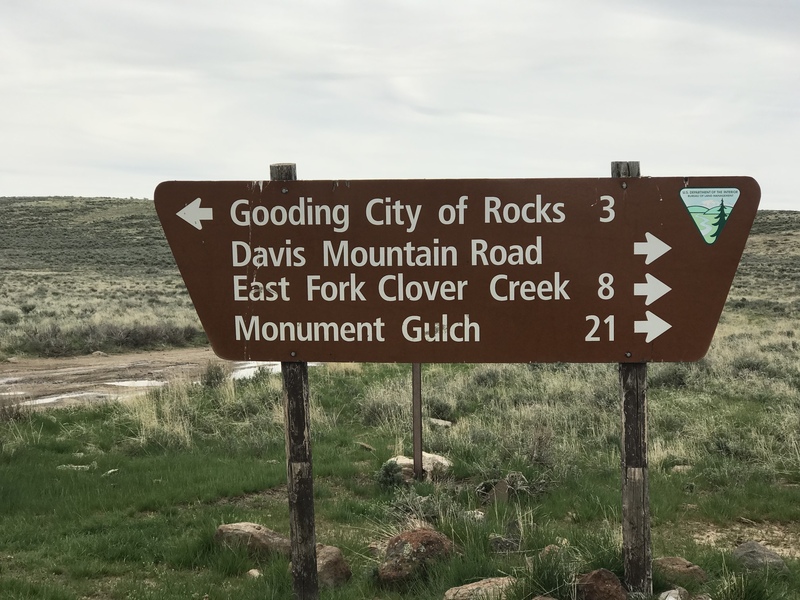 This road runs for 21 tortuous miles between the Gooding City of Rocks Road in the east and the Monument Gulch Road in the west. Davis Mountain Road crosses rocky terrain as it weaves in and out of the southern slopes’ drainages and the central section’s major peaks. The road passes just west of the summit of Davis Mountain. The eastern end of the road is in fairly good condition until it reaches the East Fork Clover Creek just south of West Twin Peak. From this point, the road deteriorates significantly. In places, it is deeply rutted and rocks present difficult obstacles. The road is better suited for ATVs in spots. The Davis Mountain Road provides access to all of the major peaks between Fir Grove Peak and the Knob. The sign at the junction where the eastern end of the Davis Mountain Road starts. Not shown is the mileage to the turn for Davis Mountain, which is 13 miles. 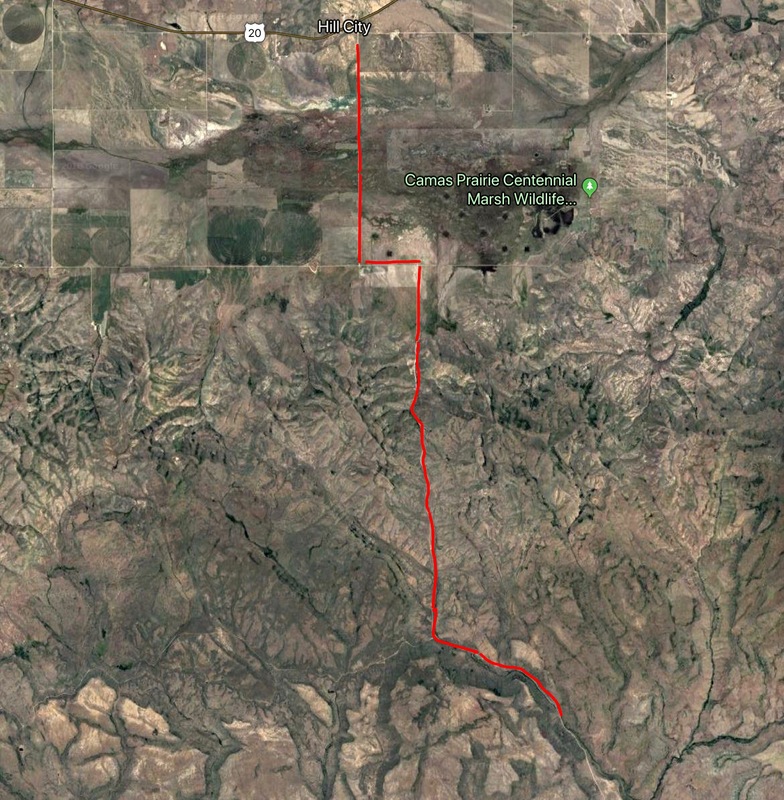 A GPS track for the Davis Mountain Road. 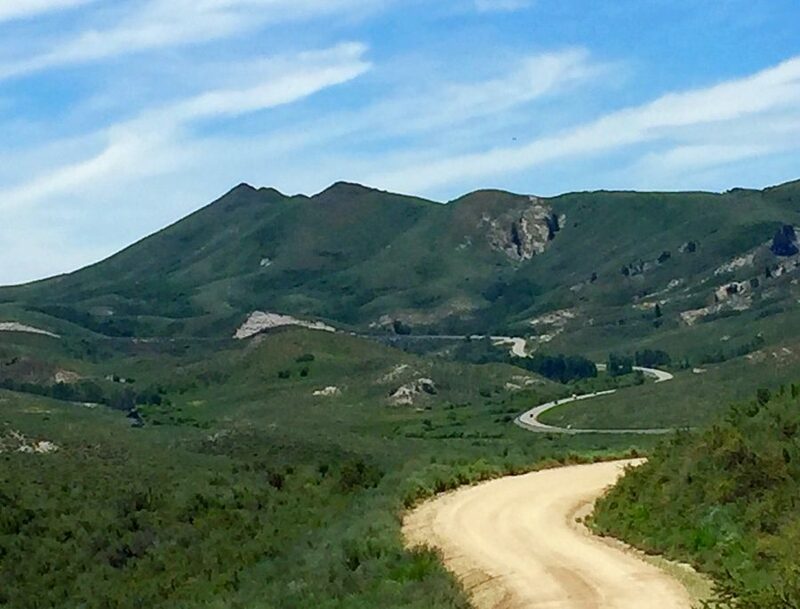 This road requires a 4WD with skid plates, all-terrain tires and a driver with a lot of patience between the East Fork Clover Creek in the east and the Knob in the west. Beware it is a challenging road. This highway begins at a junction with US-93 in Shoshone and then heads north across the Big Wood River valley, into Blaine County, past the Magic Reservoir Road junction to the west to US-20 at Timmerman Junction. Note: WSA information used on this page was extracted from the publicly-available BLM studies of these areas.